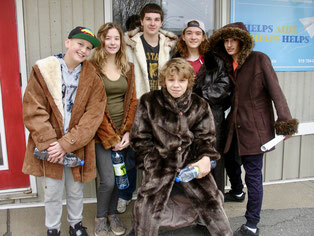 Thanks to the support of the community, Stanstead’s 3rd annual Winter Clothing Sale was a success! This student-led fundraiser, hosted by Phelps and in collaboration with Stanstead’s youth centre, Le Lounge, received many gently used winter clothing donations and some delicious baked goods. Enthusiastic student volunteers were key to the event’s success. Not only did they enjoy baking sweet treats to be sold, but also had a blast working together to give back to the programs that they enjoy weekly. The fundraiser reached its goal; Phelps will able to buy several ipad chargers for students who do their homework on ipads and Le Lounge will be investing in a flag-football kit for its active participants. Cookies, coats and gloves were sold, but above all many laughs were exchanged as the students spent the whole day with us at Phelps.